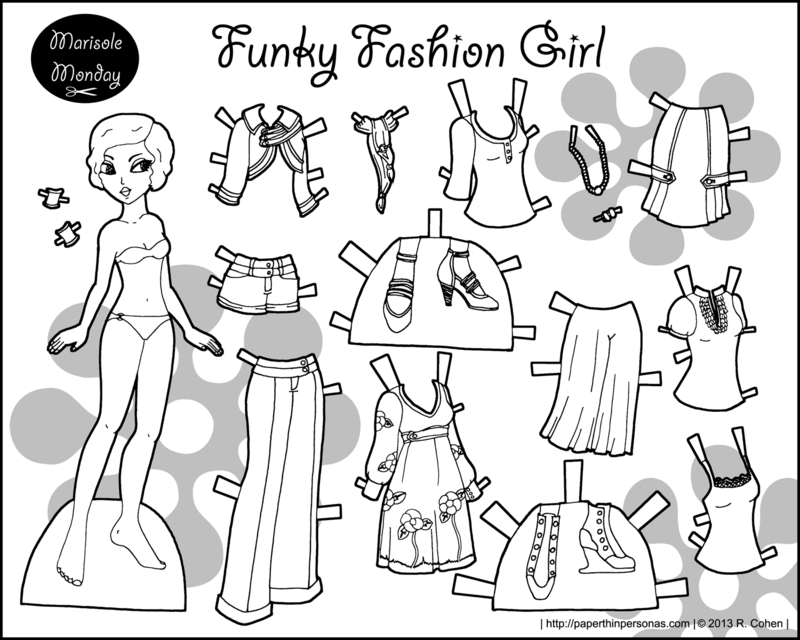 Anyway, I’ve had several comments lately requesting old paper dolls re-done in black and white for coloring. So, today I’ll be posting three older Marisole Monday Paper Dolls in black and white. Plus I didn’t quite get done with my planned post, so there’s always that too. I’m doing my usual January poll about what th blog should gain in the next year. Feel free to vote and there’s a drawing/contest with details here. This was a pretty early Marisole paper doll. I think she was the first Caucasian Marisole paper doll (which still looks odd to me) and she’s, unsurprisingly, a redhead. I’d had a few requests for redheads, which is where she came from. I see a lot of problems with her now that I’ve drawn a lot more Marisole paper dolls, but I still like her hair. I love winter coats and I drew this right after moving to Illinois. It was a cold chilly snow filled place and I particularly like the snowman and the snowball. This remains one of my favorite sets. It’s also a rare set where Marisole’s original hairstyle is visible. I was never really pleased with how this Sporty Girl paper doll came out. I drew her because I got a request to do some spots outfits and the requester wrote a really nice email about the importance of girls in sports.I thought the intention was really good, but I think the desire to do something that my heart wasn’t in really shows. I was drawing it because I thought I should, not because I liked the idea or I was committed to it. On the other hand, I like her shoes. And that is all for this Monday. There will be another edition to Greta’s Trousseau later this week. Congrats! It’s been a lot of fun watching your journey. I was a lurker long before I was a participant and your blog continues to be lovely. I’d like to see 500 more, so get on that!! Wow. 500 posts. That’s really cool. And impressive. Soooo just saying something, I WANT MORE BRUNETTES. I’ll see what I can do. 🙂 I do have two Pixies in the works. Neither is brunette…. but they should be up later this month. Thanks! Also, I am loving your website at the moment. I go on paper doll kicks. sometimes i love them other times i hate them. Of the 96 different Marisole Monday designs I’ve posted on the blog, about 49 have appeared in black and white. Converting a full color design to black and white is actually a lot more time consuming than it might seem, especially for early paper dolls where, in some cases, I don’t have the original Photoshop file and have to work from the PDF. Maintaining this blog is a hobby, I only have so many hours a week to devote to it. (For example, I’m writing this reply during my lunch break at work.) Generally speaking, if I have an hour to work on the blog in the evening, I would rather spend it working on something new than going back to old work. However, I know a lot of my readers want to see more of the Marisole paper dolls in black and white, so I have been doing a bit of converting in my spare time.